Grease 6 (4 oz.) ramekins. In saucepan, combine milk and whipping cream. Cut vanilla bean lengthwise and scrape vanilla bean seeds into saucepan; add vanilla beans and salt. Bring to a low boil. In bowl, whisk together eggs, egg yolks, cinnamon, rice, and ½ cup sugar. Remove vanilla beans from cream mixture. Slowly pour hot cream mixture in a thin stream into the egg/rice mixture, whisking constantly. 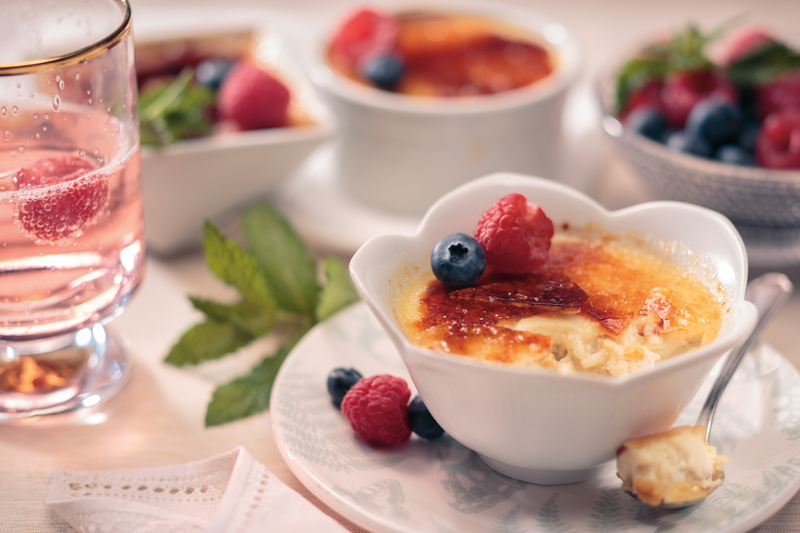 Pour or ladle into prepared ramekins; place ramekins on a large baking sheet and place on oven rack; carefully pour enough hot water to reach halfway up the sides of the ramekins. Bake until edges are set and centers are still slightly jiggly when shaken, approximately 25 minutes. Remove ramekins from water bath and place on rack to cool for at least 10 minutes. Cover; chill at least 3 hours. When ready to serve, remove from refrigerator and sprinkle remaining sugar evenly over tops. Broil 5-6 inches from heat until sugar evenly melts and becomes a caramel color. Remove from oven and serve immediately. (Sugar may also be browned using a professional culinary torch. ).